Below we have shared some of our knowledge, built through over 25+ years of experience, on common causes / reasons for turbocharger failure. This guide is aimed at helping you to understand when your turbocharger is in need of a service, repair or rebuild as well as helping ensure your turbo does not suffer any other problems. As the turbocharger speed and the engine load increases, the need for oil to act as both a lubricant and as a coolant increases. If there is a delay in oil reaching the turbocharger bearings for even a short period of time then bearing failure will occur. A delay of a few seconds can result in a catastrophic failure. Oil delay can be recognised very simply by the blueing or discolouration of the bearings or the turbine shaft itself. The blueing is simply the colour of the shaft when it has been exposed to excessive heat. Remember if the engine check oil light has come on it may already be too late to prevent damage or wear to the turbocharger. Lubrication is a crucial part of the engine and although modern oil technology has gone a long way in providing good oils oil deterioration can still occur. The high temperatures that are present in modern engines can cause oils to crack or break-down. This action produces carbonaceous (tarry) materials, which stick to the engine rings and cause other troubles. Oxidisation is caused by the hydrocarbons in the oil mixing with the oxygen; this produces organic acids of which there are two main types: those with low boiling points and those with highly corrosive. These products are responsible for several of the problems on diesel engines and turbochargers. If the acids are al-lowed to become concentrated, they will attack the bearings etc., causing pitting and subsequent failure. Also they react to the remaining oil to form ‘sludge’, this is then deposited throughout the engine, particularly in the filters aggravating the turbocharger oil supply. Heavier oxidation causes hard varnish to appear. Where sludge is allowed to accumulate in the oil systems, as this passes through the turbo it is thrown by centrifugal force from the rotating shaft against the walls and internal surfaces of the bearing housing where it can stick and impede the free oil flow. In time the build-up will cause problems with oil drainage, resulting in oil leaking from the turbine end of the unit. If this matter is allowed to accumulate on the turbine side, the heat will cause a baking to take place and the result is usually unbalance in the turbocharger system. Many people incorrectly assume that if they operate the engines with dirty or contaminated oil, the oil filters will remove any foreign matter before the oil reaches the engine and the turbocharger bearings – this can be a very costly mistake! Materials small enough to pass through the oil filter undetected can cause damage to the turbocharger bearings when the amount is sufficient to cause bearing wear and bearing-housing bore wear or if the particles of dirt are large enough to block the internal oil passages of the turbo so causing the unit to become starved of oil (more common on ball bearing turbos where a 0.040” restrictor is fitted as standard). The turbo bearings are most likely to fail long before the main engine bearings or other components begin to show any wear, simply because the turbocharger rotates at much higher speeds than the engine. A unit doing just 80,000 rpm will have a blade tip speed on the compressor wheel of 700 miles per hour. New designs of turbochargers have blade speeds of over 1,000 miles per hour! It is also worth considering that, as a natural by-product of combustion materials such as ash, soot and the un-burnt heavy ends of the fuel and water are introduced into the vehicles lubrication system. All these elements cause oil contamination. The engine itself contributes to oil break-down in that tiny metal particles produced by wear and tear will either pass through the oil ways into the turbo or oxidise and hasten deterioration. Finally, foreign matter from outside the engine, such as dust and dirt, enters the cylinders through the air intake system. Any material, which enters the exhaust or intake systems is, without doubt, going to damage the turbocharger and could well damage the engine (although normally the intercooler would prevent large particles entering the engine providing the vehicle has one fitted). As a turbocharger is a precision instrument spinning at high speed its vulnerability will become instantly apparent the first time any particles go into the casings. Damage to the compressor wheel could cause pieces of aluminium to go into the engine, resulting in engine piston, valve, liner and, possibly, crank shaft damage. The type of material will vary tremendously from dust in the air system to engine valve fragments in the exhaust system. It should also be noted that if any foreign body stays in these systems, the turbo will react with possible loss of power, black smoke, excessive oil usage and leakage and damaged wheels. Only quality assured materials are used in our turbochargers and constant quality checks are made on both material and workmanship to meet both the stringent OE specifications and our own ISO internal requirements. 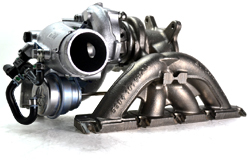 The turbocharger is probably the most misunderstood component on the engine, and it is this lack of knowledge by the owner that makes turbocharger service a very difficult area to work in. A turbo can increase a given engine power by about 30% but it will only do what the engine tells it to do. The source of power for the turbocharger is exhaust gases produced by the engine and this power is controlled by flow, pressure and temperature. If there is an engine malfunction or an abnormal working condition within the engine, the turbocharger will not overcome this. In some instances it is more likely to emphasize the problem. From this it follows that replacing a faulty unit with a new one will not always solve the problem. If you are in any doubt at all we would recommend speaking to one of experienced advisors who will be able to help you diagnose your problems based on their real experiences with turbocharger failure. 1. Remove the hose from the air filter to compressor inlet. 2. Inspect wheel for blade damage caused by foreign material. A torch may be required for close examination. Look at the leading edges for signs of impact damage or dust erosion. Examine the outer blade tip edges and all the way down the profile to check for wheel rub. Burred edges or scuffing on the profile of the housing are the usual signs. The turbine wheel ideally should be checked but it is virtually impossible to see the blade tips even with the exhaust down pipe removed. 3. Rotate the shaft and wheel by hand and feel for any drag or binding. Push the shaft to one side and rotate to feel for any blade rub. 4. Check the 'float' on the bearings, both side to side (radial play) and end to end (axial play). 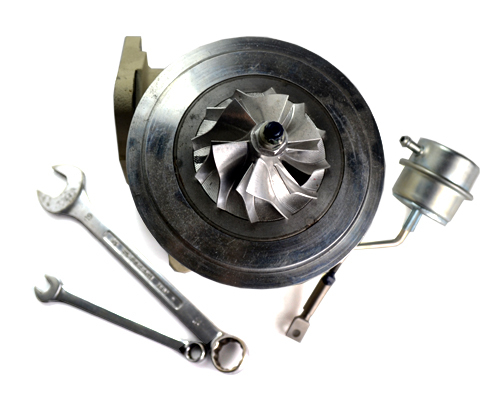 Tolerances for different units can be obtained from Turbo Dynamics' technical staff. The axial float is generally between 0.001" – 0.004" which can hardly be felt. The radial float is generally between 0.012" – 0.024" which can be felt as a definite rock. This can only be a guide as a dial gauge is required to measure this accurately. If either of these movements feel excessive then the unit will require immediate service. 5. If the shaft and wheel rotates freely, no wheel damage, binding or rubs have been noticed, it can be assumed that the turbocharger is probably serviceable. For further information, contact us for the Turbo Dynamics 'Engineers Manual'..